Mr Morongo | What am I doing here? About six months ago, Mr. Kibani found himself in a taxi going to a dowry wedding with Mr. Morongo who at around 62 was getting married for the third time and then going to jail. The men were both Kikuyu, they taught in the same primary school until each retired and they had remained neighbors and friends. Mr. Morongo had helped start the Kasuku primary school almost thirty years ago and stayed on teaching until three years ago. Kasuku village is surrounded by the rolling, mostly green hills of Kikuyu heartland. In Swahili Kasuku means parrot. Mr. Morongo taught Mr. Kibani’s seven daughters and two of his three sons and now, except for the youngest son who was still at college, they were all grown up and married. Mr. Kibani was happy with his children, they showed respect and contributed to family projects like buying him a new suit and his wife a new bed and even funding church projects that he lead. They both went to the Helicopter of Christ Church on the Gilgil road in Kasuku. If you left out the churches Prophet and the congregation, the Helicopter of Christ was actually just a corrugated iron shed, some of its corrugated iron walls had been painted sky blue and it sat on a large dusty plot surrounded by prickle bushes. Above the entrance door, painted straight on the iron there is a red cross and to one side a vinyl banner with Helicopter of Christ in large red flaming letters and then the opening hours and a cell phone number for private appointments and underneath a picture of Prophet Gilbert Gatonga in a white suite and the Prophets wife and another lady. Inside the church were rows of wooden bench pews, the windows had no glass but welded reinforcing mesh for security which had timber plank shutters which were only opened on Sundays. During the week it was dark and lonely inside. Beads of bright light made shafts through stray nail holes in the tin sheet walls in in the roof. And there was bright daylight surrounding the door and window frames like the second coming was in full fling outside. On the alter were plastic doilies and plastic flowers in Chinese vases all looking so sad. But on Sundays they were resurrected, a true celebration of life and nature and all that is good. On Sundays the church was alive, and the service might go on for four full hours if Prophet Gilbert Gatonga was particularly filled with the Spirit. On Sundays the church was filled with heart and voice and people sang so loud and danced and were seized by the Holy Spirit and fainted into eager arms and it all got mixed up with polyester best shirts and suits and body sweat and cheap perfume and new do’s of braided hair extensions and colors so if you didn’t know a women so well you wouldn’t recognize her straight off. It was here that Mr. Morongo had married his second wife. Mr Kibani straightened the brim of his hat and continued “Soon after, Mr. Morongo married again and they had another 6 children but this wife was sick and in the last 3 years before her death she was always in and out of hospital and people were wondering why is she always sick. And they were saying it was maybe HIV but no one had the proof and people were wondering how come she was sick but the husband never showed any signs of sickness. So she passed on last year around May leaving Mr. Morongo with their sixth child who was just 3 months old. 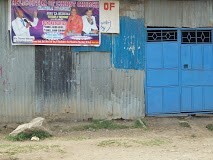 This entry was posted in Postcards and tagged Kenya, stories about International Development and Relief. Bookmark the permalink.